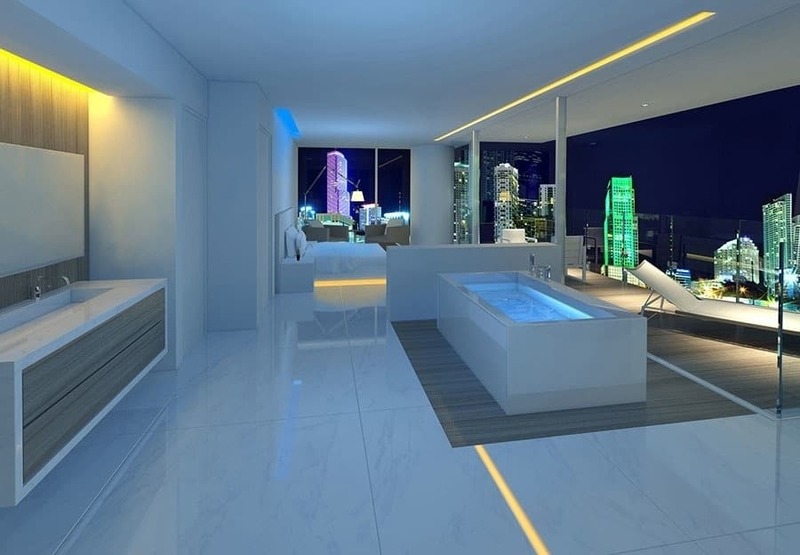 Enjoying a glorious view while taking a bath is a dream for many individuals that live in the city. The truth is when it comes to city living the view is not always as relaxing as it can be. However, when the location allows it having a beautiful view in your bathroom is pretty much a must. Its soothing, relaxing, and elegant all at once. Plus let’s not forget the view can give you an extra layer of privacy when you want it most. If you are looking to upgrade the view of your bathroom here are10 bathrooms are sure to inspire you. Not only is the view exceptional but the egg shape bathtub makes the room even grander. 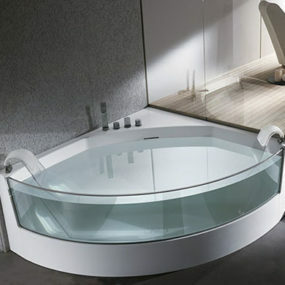 The shape of the bathtub may seem traditional but it is actually contemporary and minimalistic all at once. The greenery of the view give you that extra most of tranquility you may need. 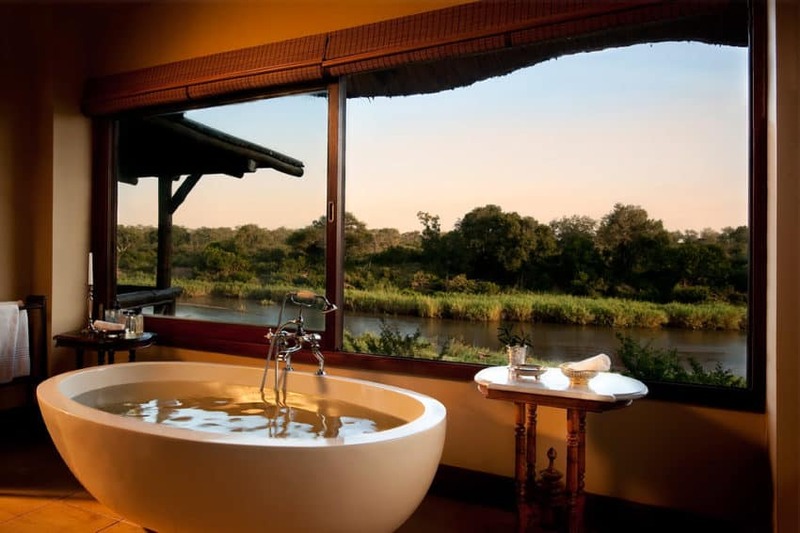 Located in South Africa this lodge offers a relaxing atmosphere with an exceptional view. Although it is not a home and rather a vacation space view is impeccable. Placed above a canopy of 100year old trees that overlook the Sabie River. With that being said the view from the bathroom of this lodge is unbelievable. The way this vacation residence was designed every room offers a beautiful view while still having the tranquility and privacy you would want while on vacation. The view is one of a kind. The fact that the water appears so close to the room will make you feel as if you were on vacation every single day. 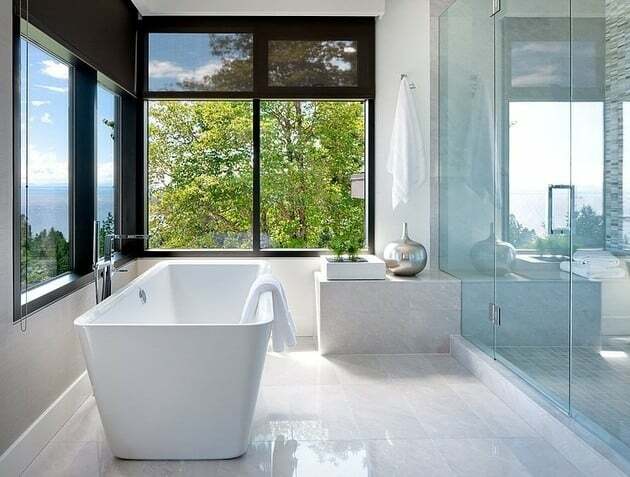 With a rectangle bathtub, you will be adding a trendy touch to this unbelievable view. Its large windows enhance even the most minimal decor. Anyone who has ever been to California will tell you the view is like no other, especially when the sun is setting. That is exactly what this bathroom will provide. Not only is the bathroom spacious and well-designed, but the view speaks for itself. The ocean view is perfect thanks to the large one way looking glass windows. 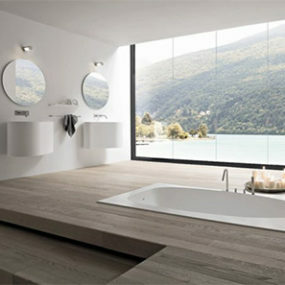 The breathtaking view that they bathroom offers is sure to take your breath away. 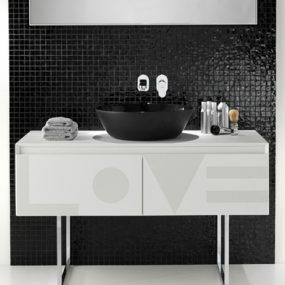 Every single aspect will make want to spend a large portion of your time in your bathroom space. To recreate the look even when you do not have the view have large windows in front of your bathtub to feel the serenity of the outdoors. 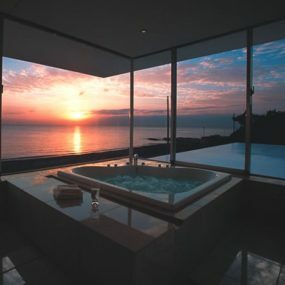 The great aspect of this bathroom view is the fact that the bathtub is completely facing outwards, which means the entire view is there for you to enjoy while you take a relaxing bath. 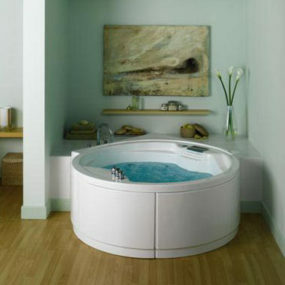 The tub offers streaming jets that give you a Jacuzzi feel while you wash the day away. The view is the beautiful and breathtaking scenery of the Gulf of Mexico. From the moment you saw this photo the very first thing you may have noticed is that the bathtub is partically in the ground. That is what makes this bathroom so highend. The bathtub is halfway in the ground and the view is exceptional. What really caught our attention from this home in Greece is the sunken marble bathtub. There is something very rustic and chic about the bathtub being partially in the ground. 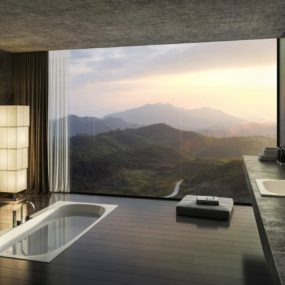 But, even though the bathtub and design of this bathroom are impressive nothing beats the view of Greece from above. The view is so exceptional the entire home revolves around it. How beautiful is this bathroom?! 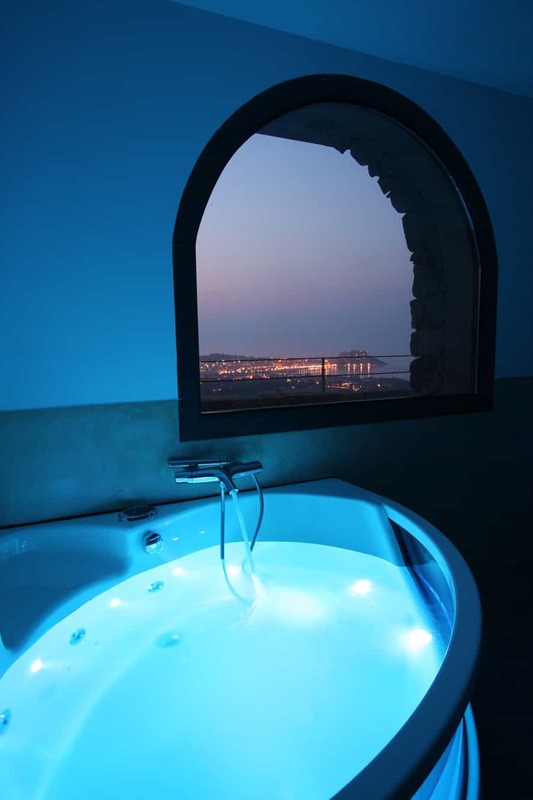 Not only is the view exceptional but the bathtub itself is a beauty. The smaller window provides the exact amount of beauty you would want to see. The lighting in the bathtub will make turning off the lights and relax a lot easier. Not only is the villa absolutely stunning all the way around, but its romance infused bathroom is just as amazing. Offering a gorgeous view of the sea from a uniquely shaped window has never appeared so beautiful. The island looks even more gorgeous when you are relaxing and enjoying time to yourself. Having wood from top to bottom makes this room a rustic dream. The beautiful log texture surrounding the copper bathtub makes the space feel even more-rich then it already is. Having a vintage bathtub completes the decor with the beautiful natural view of nature. If ocean views are not your favorite, then this may be the one for you. This rustic bathroom offers more than just a spectacular mountain view its rustic, yet contemporary design is gorgeous to look at. 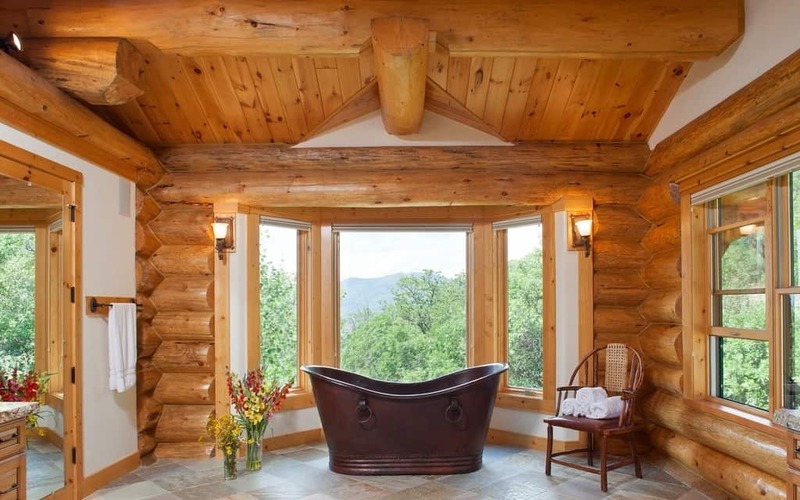 With a copper tub that is surrounded by the serene feel of wood all around the room. You can also smell the wood from, just look at the images of this beautiful residence. The diverse amount of marble makes a unique yet beautiful contrast between the two. Especially when it is paired with the greenery from the great outdoors. Another beauty that is offered in this room is the rich wood that is featured in this bathroom. Plus lets not forget there are two showers that upgrade and give a luxurious feel to the room. There is something very organic and relaxing about having a scenery of trees as the main view in your bathroom. This luxurious bathroom combines the tranquility of having a green tree top view as the main focus while having a marble bathroom. The entire bathroom is covered from head to toe in marble which gives it an upscale feel. Plus, let’s not forget marble is very on trend. 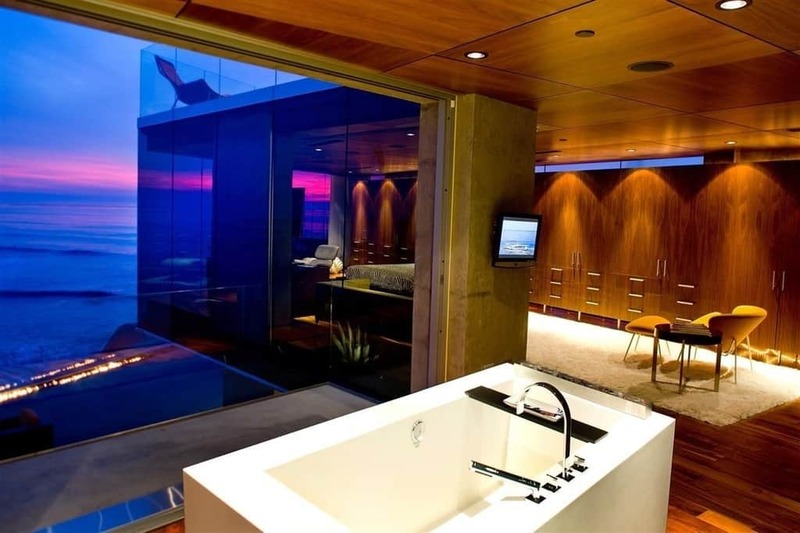 The view is exceptional in this bathroom. 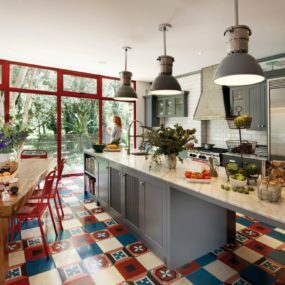 The simplicity of the space makes it stand out even more. 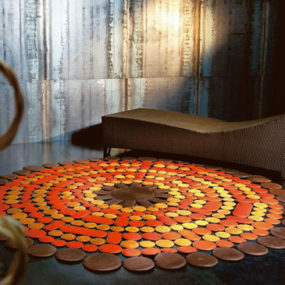 Its simplicity makes the room appear spacious, trendy, and fun while providing a painting like scenery from every angle. Miami nights are not only fun, but they are also gorgeous, especially if you are enjoying them from a high-level residence. 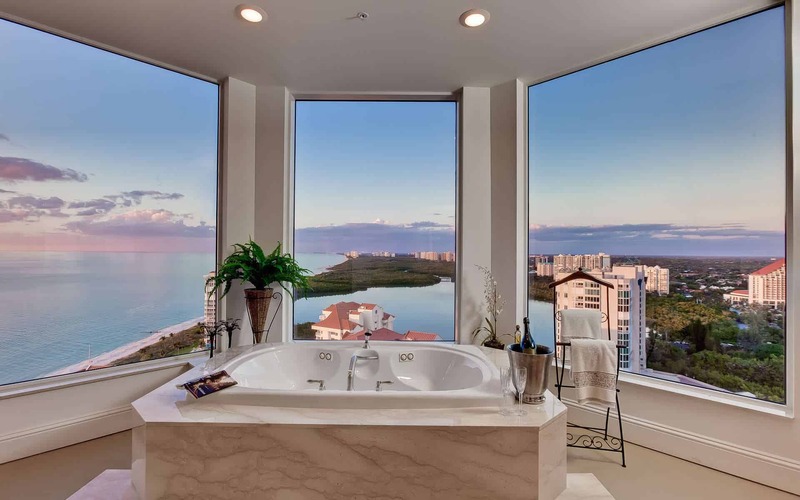 This bathroom right off of the master bedroom gives you the Miami views you want to see. The view is of the city of Miami at nights is one of a kind. The beautiful buildings surrounding the home light up the bathroom in the most glorious way. The new and modern bathtub adds a trendy touch that is exactly what this bathroom needs. A large window in the bathroom is perfect for making the space appear larger then it normally is. In fact, having multiple different windows will work beautifully together to provide the exceptional view of New York City. There is something fun about having the entire view of the city right in your bathroom. Just like Miami nights are one of a kind New York City is just as or even more impressive. This traditional yet modern bathroom gives you the view of New York City in its complete beauty. The beauty of this bathroom comes from its simplicity. The bathroom is simple, but the view is so breathtaking you will want to be in the bathroom time and time again. The view is beyond breathtaking because it is overlooking the English Bay in West Vancouver. The bathroom is simple yet gorgeous all at once. Its simple décor allows the view to be the main attraction of the bathroom space. The large windows will give you all the tranquility you seek while taking a shower. 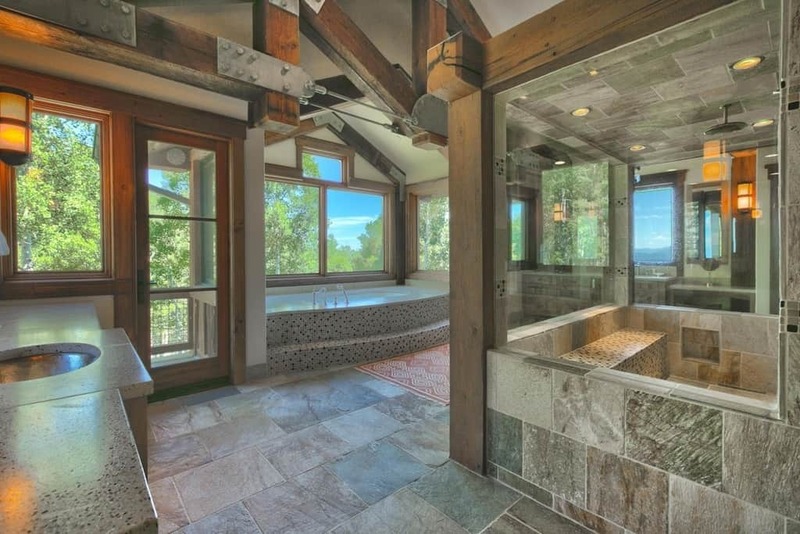 The view from these bathrooms will make you want to create an incredible view of your own. Which of these views do you want to have in your home? Please let us know in the comments below.